Turn down outside to create pilot, then scratch for drill points. Once I got the American lathe it, it was cheap enough but it came with a beddraggled beat up 24" cast iron chuck that might have come with the lathe new. In order to use the American lathe for a variety of things, I needed to round up a variety of chucks so I shopped ebay in earnest for lathe chucks and went to some live auctions as well. At the end of the day I settled on 4 chucks, a 3 jaw and a 4 jaw as large as I could get (on the cheap), and a 12" 3 jaw and a 12" 4 jaw. The same issues apply with the 4 jaw units. Four jaw chucks are usually cheaper, particularly if you get a cast iron one. Twenty inch cast iron 4 jaw chucks seem to be pretty common on ebay in good condition. They seem to come with a number of mid sized lathes and then don't get used and are sold off separately. The cast iron chucks are a little more fragile than the steel ones, and need to be used with greater care, but for the occasional user they seem appropriate. 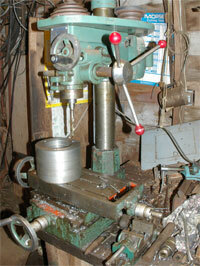 I've got an 18" steel L-2 mount chuck for my London lathe, but so far I haven't built an L2 adapter for this lathe. 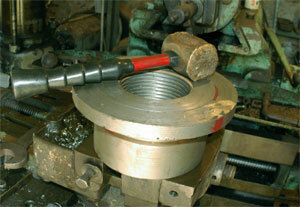 I began the mounting process by making 4 hubs from 4 chucks of 7" round stock each 5 inches long. This process consisted of drilling, then boring, then threading these 4 pieces so they would screw on the spindle of my American lathe. As we look back at the photos on the left, the top photo shows a 7" diameter slug mounted in my LMT lathe with the pilot bit. For the ATW mount the slug will ultimately be threaded to 4.25 inches or there about. The spindle is 4 inches long, so I got a slug 5" long nominally. It will get shorter over the processing as it will ultimately be machined square on both ends. For now, the hacksaw square ends will do. 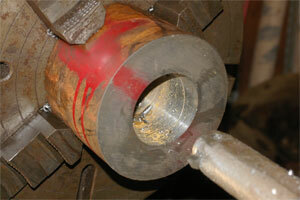 I've mounted the slug in a 15" 3 jaw chuck and pilot drilled it with a long bit about 3/8's in diameter. In the second step I drilled it all the way through with a 2-1/16th bit. There was no magic to the size except that it was a bit I found in our collection that was fairly large and looked to be sharp enought to do the job. I'll need to take the hole to around 4", the minor thread diameter of the ATW. Next I hit it with a 2-3/4" drill because drills are faster than boring bars, and finely I turn it to size with a boring bar. It is ultimately threaded with a 4" minor bore and a 4.25" major bore at 4 TPI, and first fit to the standard and finally custom fit to the ATW lathe. 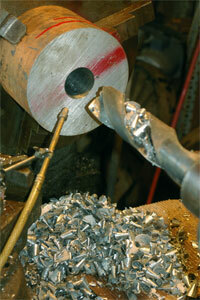 I use a die grinder with a small stone to cut the burrs out. 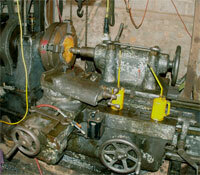 My first mount here was the Cushman 18" 3 jaw chuck which you see on the bottom left. The 7" nominal diameter is not large enough to accommodate the 'bore hole' on the back of the Cushman which is nominally 9.5". Consequently we rough cut a piece of 3/4" plate with the cutting torch and turn it to a ring. The ring is shouldered slipped in position over the hub and welded in position. The bolts from the chuck (3 ea. 5/8's bolts) actually go into the hub, but the ring serves as a pilot to assure that the chuck is centered properly---critical for a 3 jaw chuck. You can see the front of the 18" Cushman in action on my hydrualic cylinder page. Look carefully at the jaws. 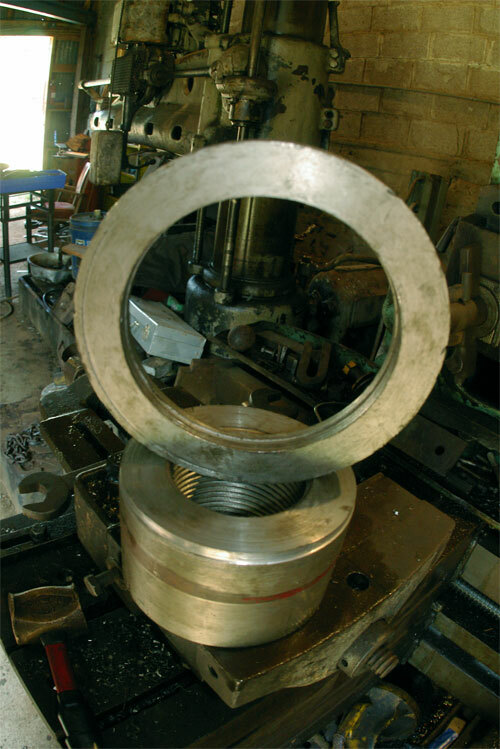 Here I was working on about a 7" diameter ring. If the jaws are in the normal position (big side in), the top jaw and the bottom jaws align with one another and both grip. However if the jaws are reversed, the bottom jaws are a little proud of the top jaws even in the narrow position. This is a convenient way to space your work out from the chuck a little allowing you to work all the way through without hitting anything. In this photo you see the bottom jaws protruding about 1" from the body. This is within the manufacturers range. This is an 18" chuck that is suppose to grip to 18". You get there by moving the jaws to the 'wide' postion --you can see the bolt hole in the photo) and then the outer most steps on the jaws will be at about the diameter of the chuck---how you grip 18" with an 18" chuck. The rest of the story about the hub is on the ATW page. 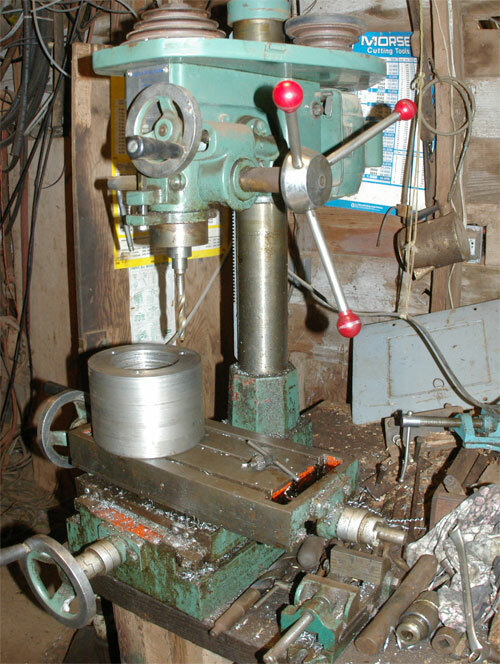 This American lathe has a spindle that is threaded 4 threads per inch and 4 inches long. 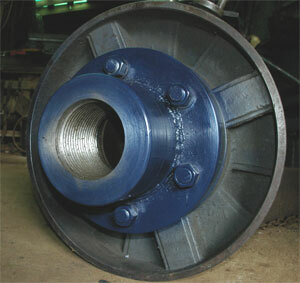 The major thread diameter is 4.25" and the minor diameter is 4" exactly. On the left you see the runup to mounting a Cushman 18" 3 jaw. 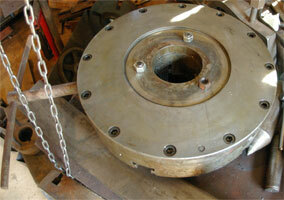 On the right we have a sequence of mounting a Cushman Industries 12" Chuck. 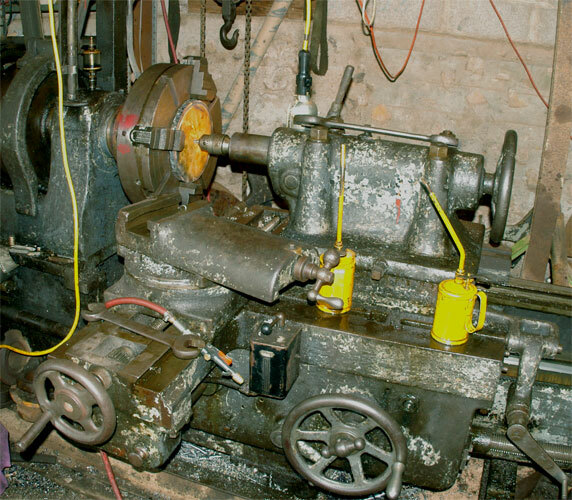 The target was the same American Tool Works lathe, so I used another hub that I had made identical to the one on the left. 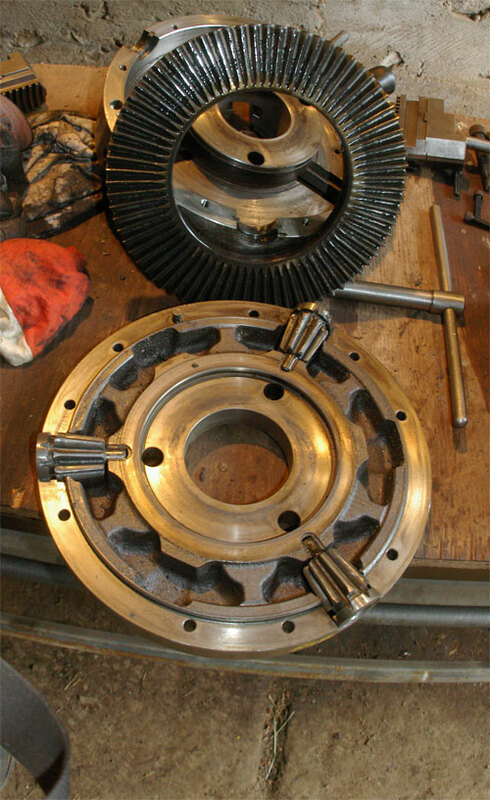 The difference is that with the 12" chuck the pilot is only 6.987" so my nominal 7" hubs didn't need a lot of modification. The bolt circle was 5.12" which fit well on the end of the hub, so I just needed to adjust the diameter of the hub ever so slightly, and drill and tap it for the 3 ea 5/8" bolts and bolt it together----The easiest of all the chucks I mounted for this lathe. Before I mounted the chuck, however, I dismantled it and inspected and cleaned the indsides of it. 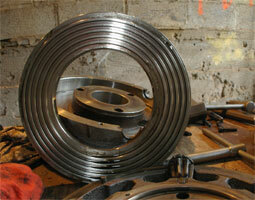 The first two photos on the right so the interior of a Cushman Scroll plate chuck. 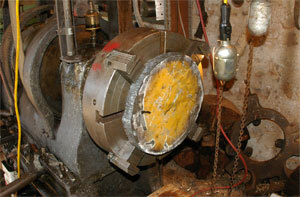 The jaws sit in the scroll which is rotated with the spider gears to open or close them. This should give you a good appreciation of the mess you can make out of a chuck if you over tighten it. In doing you you may not break it, but if you bend the threads on the scroll plate things really don't work right. This is profoundly the case if the jaws are partly off the scroll. 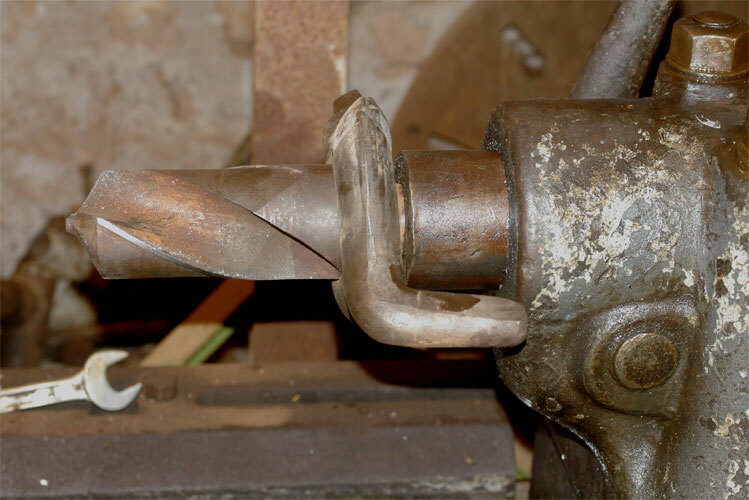 This means some threads might be bent but not others, so when you move the jaws back to where they contact all the threads, the threads won't align with the jaw making for a very tight spot. It seems likely over time that this 12" Cushman will be the most used chuck of the ones that I have simply because it works on smaller things nicely. 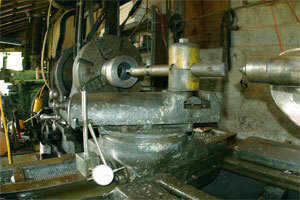 On my London lathe I have an 18" steel 4 jaw and a 15"3 jaw, and there the 18" got used the the most over the years. I didn't choose the Skinner 15" but that is what it had. In retrospect, a 15" chuck is a bad compromise of a size. It's too big for small things and too small for big things. Also the Skinner did not have reversible top jaws further limiting its usefulness. It has 1 piece jaws. I don't know what its minimum recommended holding size is but the 15" Cushman 3 jaw is at 3" (notably larger than the 2.5" on the 18".) The reason for this is that the Cushman 18" has 2 places to bolt down the top jaws (a wide and narrow position) which gives it more range while staying on the scroll plate. Of course even better is the Cushman 21" with 3 bolt down locations for the top jaws and a minimum size recommendation of 2.28". This is a case of where bigger is smaller. Four jaw chucks have some of the same minimum size issues but not as badly. While you can get the jaws off the adjusting screws going for small things, when you break a 4 jaw it is usually the thrust bearing that fails, (from over tightening--or dropping your work out of the tail center prying the jaws open, and those issues are exactly the same regardless of the diameter of the object being gripped. An appropriate way to hold small objects in a large chuck is to simply have a small chuck (4 to 6" one that you simply grab in your big chuck. The D1 mount, also called the cam-lok mount is the closest thing to a standard mount for lathe chucks at the present time. The mount has been around since the 1930's but has gradually displaced the L mount and the A mount, with the thread mounts long gone. With imported lathes using the D1 series mounts almost uniformly, it is the market. The D series chucks have a number of lugs on the back of the chuck with a half moon notch out of them. These plug in holes on the front of the spindle and cams are turned with the chuck wrench into the half moon notches locking the chuck in place. This does not mean that every chuck will fit every lathe on the planet now. Within the D1 type mounts there are multiple sizes, including the D1-3, d1-4, D1-6, D1-8, D1-11 and D1-15. The number on the end of the mount describes the nominal diameter of the outside of the mount with the diameter rounded down. Thus for example the mount diameter of the D1-11 mount is actually 11 7/8". 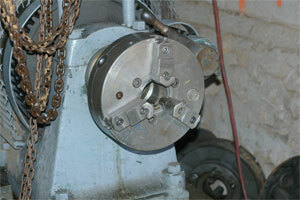 The various sizes recognize that different sized lathes need different size attachments. The lugs themselves are of various sizes consistent with the size of the mount, and are studded into the back of the chuck and held from unscrewing themselves with a setscrew. They are generally not screwed in 'tight' because the way you adjust the locking mechanism so the cam can go over center is to screw the lug in or out in the back of the chuck as needed. The bolt pattern, and spindle shape of the A mounts and the D mounts is the same. The difference is that with the A mount the bolts come through from the front of the chuck and thread into the front of the spindle. 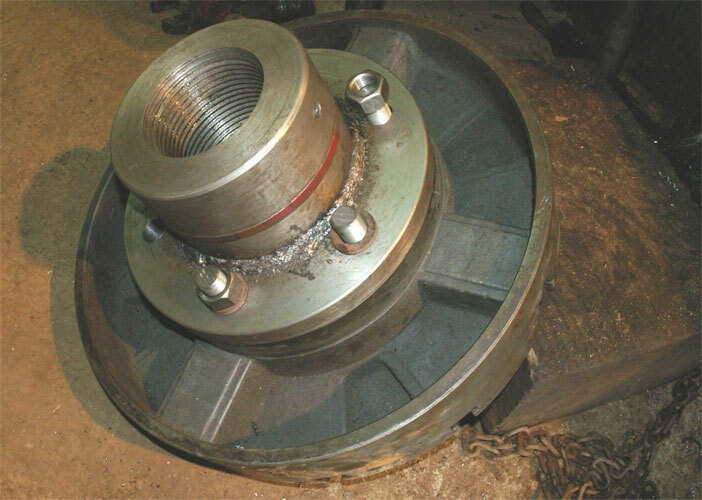 Thus A mounts can be adapted to threaded spindles much as flat backs are except that the pilot for the A and D mounts is in the center of the spindle instead of the outer edge of the hub as is the case with a flatback. 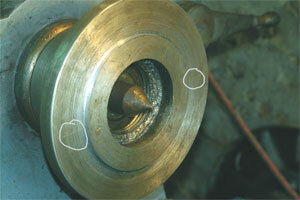 The problem in converting a D1 mount to a threaded spindle is this. 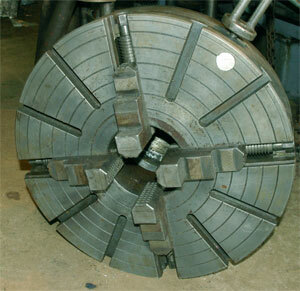 The bolt circle that holds the chuck on requires the bolts to come in from the back. This means in the smaller sizes the bolt circle will conflict with the threaded spindle, but in the larger sizes, the bolt circle is big enough to be outside the hub so the conversion works well. For example the D1-11 mount has a bolt circle diameter of 9.25". 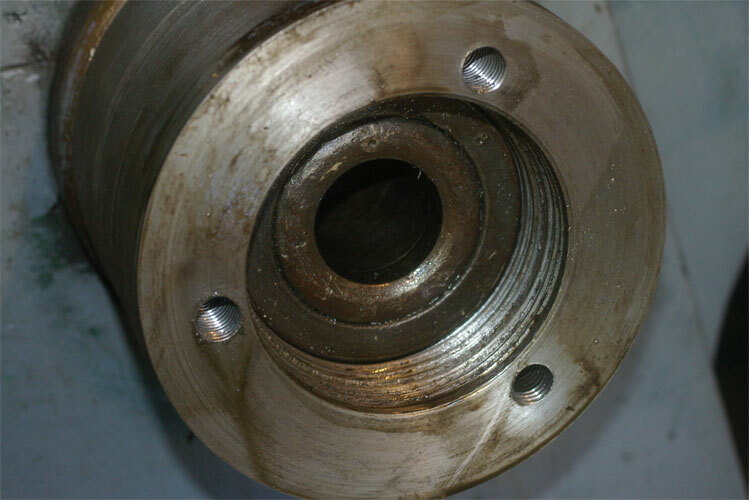 Even with 7/8's bolts this is big enough that the threaded spindle and hub will fit inside of it, but with smaller sizes the conflict can make the mission impossible depending on just what size of spindle you have. The mount for the D1-11 began with a 'hub' just like the other chucks I mounted had--- a 7" diameter segment of rod that was drilled, bored, and threaded to fit the spindle of the American Tool works lathe. Now for the Cushman flat back, I used a 3/4" plate for a ring which was lightly welded mostly to keep it from falling off while I machined it. There the ring only served as pilot, and the bolts that held the chuck went into the hub. 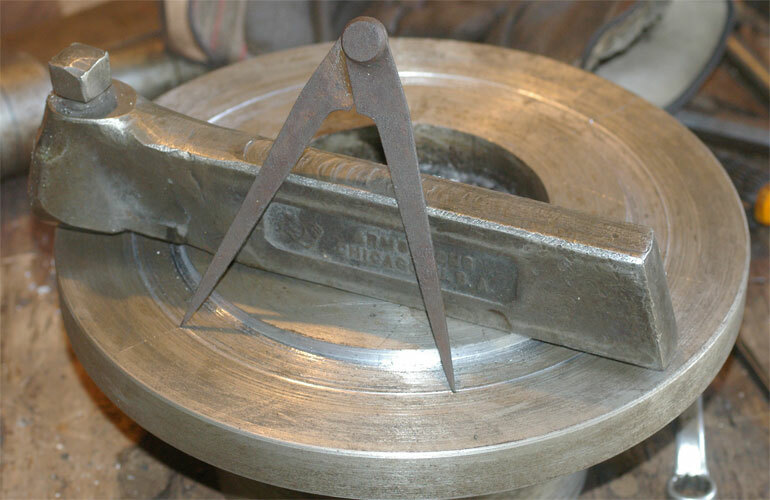 In this case the chuck will be bolted to the plate, and the plate must be turned thinner to create a center pilot on the front. 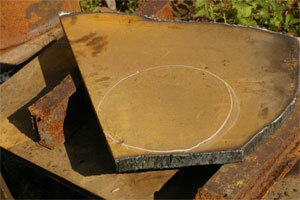 For this reason I started with a 1 1/4" piece of iron cut from the main frame of a log loader that we are scrapping. We torch cut the approximate circle and then put it in the lathe and turned it. 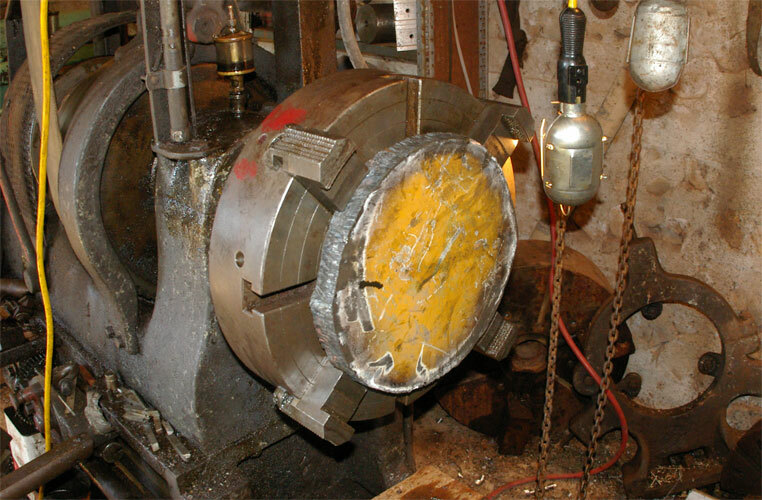 Ultimately the plate was turned true on both sides, and got a nominal diameter of 11 7/8" with a bore hole of 5". I put a very shallow 7" diameter recess on the back side of it so it would center on the hub, and then it was heavily welded there both on the back and inside the front nose. 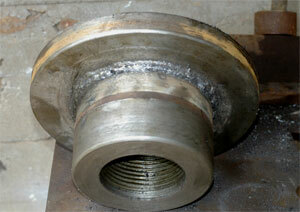 The threads were protected with heavy grease during the welding operation. It was stick welded with 7018 using multiple passes. 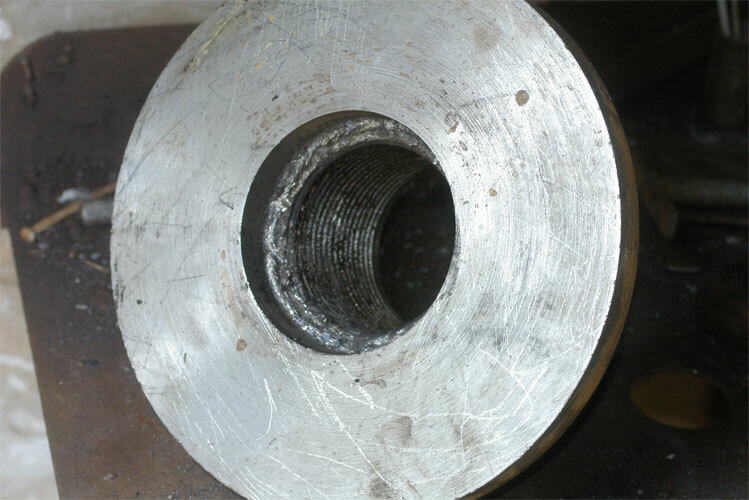 Ideally a unit like that would be annealed after welding to get all the stresses out of it, but I bypassed that step and let it set for a day after welding and went to work on it. First I turned the face on it. The D1-11 have a 7.75 inch pilot with a small taper on it (approx 7 degrees). Officially the pilot is .69 inches long, but I saw no need for that. 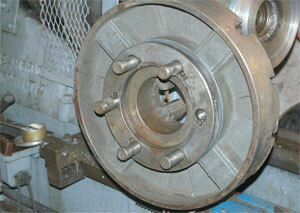 I am mounting a 4 jaw chuck, so the possibility of a small runout is not relevant. I turned the outer part of the 1 1/4" plate down to 1" making for a 1/4" pilot in the middle. I eyeballed a taper and made the center part an easy fit in the pilot of the chuck with no rattle. The machinst handbooks speak of using a sweat fit to minimize runout for a 3 jaw chuck, but with this being a 20" 4 jaw, I deemed 'no rattle' as a sufficient standard. I had roughed the outside diameter before mounting and welding, and I now turned the outside to the final diameter and eased the corners. 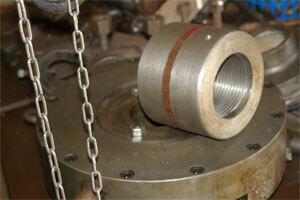 Both of this and the turning of the pilot were done with the hub mounted on the target lathe, my ATW. Most of the earlier work was done on my London Lathe holding these pieces in a chuck, but for the final 'face off' you want the hub on the lathe as it will be used which is what I did. Finally I put a center in the headstock, and installed a sharp pointed cutter (actually I used a threading tool). I carefully aligned the point of the cutter with the point on the center. 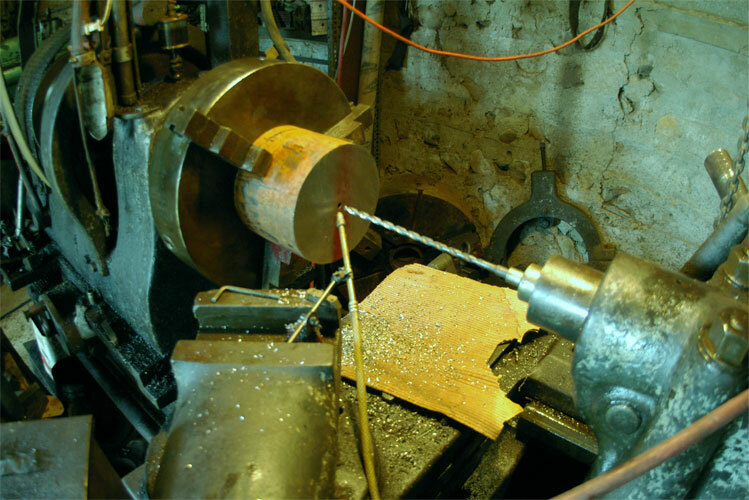 I then scratched laterally on both sides of the plate without turning the lathe by cranking the cross feed from one side to the other. This would mark 2 places on the plate 180 degrees from each other which is part of the game as I had 6 evenly spaced holes to drill. I then scored a circle on the plate at 9.25" diameter--the diameter of the D1-11 bolt circle. Where my scratches and the scoring crossed became to of my bolt holes. I then set my divider to the distance between the bolt holes and walked off the rest of the holes. Having 2 known holes made this fairly easy, as I could walk in both directions to check my work. The D1-11 cams are studded into the back of the chuck with a 7/8" NF thread. 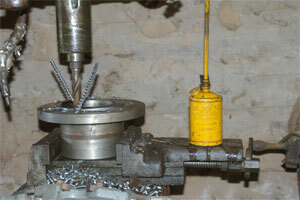 It idea here is to use the pilot to align the chuck and the bolts to clamp it down. You don't want the bolts to bind on anything as this will distort something so the holes in the plate were properly drilled a bit oversize. I used a 15/16" bit. I tried to use the little Jet Drilling and Milling Machine but it just wasn't up to handling a 15/16" bit. IT would chatter but you just couldn't get it to drill, so I took it out to my Radial Arm Drill which has a power feed, and it drilled easily. My drilling job was accurate enough that I was able to start bolts in all 6 holes without filing out any of the holes, though 1 is tight enough that I ultimately will file it out a little just to give it some slack as we realy don't want a bind in the bolts. I could have used 7/8" NF cap screws for the job, but the bolt store price them as a special order item at $12.50 each. A 3 foot section of 7/8 fine threaded 'all-thread' would do the job just as well and was a lot cheaper so stud bolts made of all thread is what it got. While they are not as strong as 7/8's grade 8 cap screws, enough is enough. There are 6 of them. The Cushman is held on with 3 allen headed bolts which are 5/8's and on a much smaller bolt circle. With that the 20" D1-11 cast iron 4 jaw is mounted and ready to go to work.